SANTA MONICA, Calif. – Aug. 25, 2014 — Colors and squares and tight spaces – oh my! Tetris® Battle: Fusion, an all-new game based on the addictive Facebook game Tetris Battle and multiplayer tribute to the game that singlehandedly spawned the puzzler genre, is now available for free on OUYA (with a $4.99 unlock for local multiplayer and AI battle mode). Developed this year by Tetris Online, Inc. to honor the Tetris brand’s 30th anniversary, Tetris Battle: Fusion puts players’ spatial strategy skills to the test. Tetris Battle: Fusion lets users duke it out against the dual forces of gravity and geometry in a head-to-head edition of the arcade staple. Players can keep tabs on how their opponents are faring in order to optimize their own strategy, adding a frenetically competitive twist to the fast-paced shape-placing action. 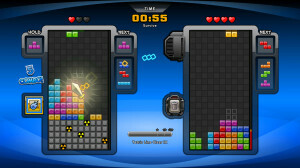 Tetris Battle: Fusion also adds a few new elements to the core gameplay experience. Throughout the game’s 50+ unique levels, players must collect Amulets, which determine the offensive and defensive capabilities of a player’s next Matrix (playing field) and can be leveled up by gaining experience points over time. At the start of each match, users equip Amulets to determine the limits of their gameplay, and then can fuse Amulets together for added strength as a player’s space-shifting prowess increases. The game also features a 1v1 local co-op mode that enables friends in the same room to go head-to-head using previously earned Amulets. As a player’s arsenal of Amulets grows, so will his or her ability to become the Tetris champion of the world – or at least their living room. 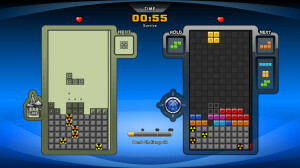 To learn more about Tetris® Battle: Fusion, contact TriplePoint PR at ouya@triplepointpr.com or (415) 955-8500. Tetris Online, Inc. is an official licensee of The Tetris Company, LLC. Founded in January 2006 by Minoru Arakawa, Henk Rogers and Alexey Pajitnov, Tetris Online is a developer and publisher of electronic entertainment properties. Titles include Tetris® Party Deluxe for Wii™ and Nintendo DS™, Tetris Party for WiiWare™, Tetris Splash for Xbox LIVE® Arcade, Tetris Battle, and Tetris Friends Online Games, which was named one of the “Top 100 Games of All Time” by PC Gamer and can be found at http://www.tetrisfriends.com. Tetris Online is privately held and headquartered in Honolulu, Hawaii.